Just Who In The Hell Is Roger Goodell? How is it possible that we are being threatened by Roger Goodell saying that he will take away the Pro Bowl if he finds it unworthy? He, himself. No All Pro Panel. No Five star Committee. Just Roger Goodell. Who does he think he is, King of the NFL? How did it happen that one man has the power to say which American traditions will live and which will die? Especially one who flaunts it with threats! Goodell called Sean Payton into his office for a secession that lasted over 4 hours. Do you really think that Sean wanted to talk to Roger for 4 hours? What was that all about? He makes the gesture to let Payton off the hook…. a whole two weeks early…. and then announces on the radio that the Saints will still lose their second round draft pick for 2013. So, the punishments handed down by Sir Roger are not really over yet, are they? In the case of the Saints, the commissioner said in April that he would consider whether there are factors that would support modifying the forfeiture of the team’s 2013 second-round draft choice. What does he want here, blood? There are signs up around New Orleans showing a picture of Roger Goodell and below saying “DO NOT FEED THIS MAN”. How does a person gain such animosity? Frank Gore was fined $10,500 for wearing his socks too low. Excuse me. Where does all that money go, I wonder? I remember one Sunday during the regular season when Goodell’s office issued over a quarter million dollars in fines……in one day? What are they doing with all that money? The NFL offices must have a hell of a commissary! Not only that, now Goodell is pontificating around creating speculation about where he will allow the 2014 Super Bowl to be played. Like it his decision and his alone. Where does this guy come off? 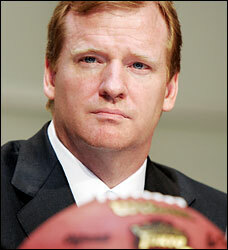 So, the question is clear, who controls Roger Goodell? Who is there to say “Enough now, Roger, you can’t do that”? Is there not governing body that the players and fans of the NFL can appeal to. Goodell seems to be the king of the hill these days doing whatever he takes a notion to. Do we have to appeal to Obama to get the Pro Bowl back if Sir Roger decides to take it away?